Snowy weather is just fabulous for looking at, walking in and of course skiing and boarding. But one thing it’s not so great for is driving. The trouble with ski resorts and anywhere well known for snow and icy weather is that the clouds can roll in very fast in the mountains, and what was a lovely sunny day can soon turn into a blizzard. If you don’t keep an eye on the conditions and weather forecast, you could end up with a tough drive back, or worse still, stranded in the snow. It’s always best to check the local weather forecast before you decide to go out in the car. If heavy snow or blizzards are forecast, don’t even think about taking a chance on a trip out unless it’s absolutely essential. Try to plan your route using the main roads which are more likely to have been gritted. Driving in the cold or dark means you’ll use your car lights, heaters and windscreen wipers more than usual, which in turn can put a lot of extra demands on the car battery. Don’t run any unnecessary car electrics – you never know when the extra power will come in useful. Make sure that you always have your mobile phone, and that it’s charged up, when you’re driving in snow and icy weather. You’ll also need to keep a torch handy, and pack a first aid kit, and have some warm blankets stowed away just in case. Take some food with you in case you get stranded, and a warm flask of fluid to keep you hydrated. Let people know when you are leaving and where you’ll be. Take an emergency car kit with you that contains some de-icer and a scraper, jump leads and a shovel, in case of a vehicle break down. 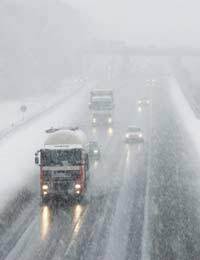 Always assume the worst when it comes to winter weather conditions, and allow yourself a little more time to get to your destination, and when you set off, it sounds obvious but make sure that you have enough fuel for your journey – remember that stopping and starting in congested traffic uses more petrol too. Low sun can be dazzling during the winter months so always have your sunglasses in the car, and keep the car windscreen as clean as possible to avoid any glare. If get stuck somewhere or break down in cold weather, and have to dig your car out, clear the snow from the roof as well as from the car windows so that it doesn’t fall onto the windscreen when you drive off again. This also applies to setting off on a journey after a snowfall! If you’re driving in some Switzerland and some Scandinavian countries, you’ll have to use headlights at all times in winter. Dipped headlights are also a legal requirement in Austria, Germany, France and Italy, mainly when there’s poor visibility so check the local laws. Don’t forget that stopping distances will be longer in cold weather, snow and ice, so leave more room between you and the driver in front.Don’t drive in boots, especially if they are covered in snow, always wear dry shoes. Visibility will be best during daylight hours in winter – this is really important to remember if you don’t know your route well.